Many people don’t realize how many ways they can use a pocket knife until they actually own one. A good every day carry pocket knife can be as essential as identification and a smart phone. Whether you’re camping, hunting, or working around the house, your every day carry knife needs to be practical, versatile, and fit your own specific needs. The following information begins by describing the features of what makes a great pocket knife. Then three of the best knives on the market are listed and what makes each of them an excellent knife is described in detail. The blade of any knife is the heart of what makes a quality knife. Having a knife that’s razor sharp is crucial. What the blade is made off, how often it needs to be sharpened, and how it reacts under various conditions are important considerations when choosing a knife. Most blades are made of either stainless steel or carbon steel. Carbon steel tends to stay sharper longer than stainless steel. Stainless steel, however, is known for its durability, strength, and rust resistance. There are more detailed aspects of the blade you need to consider when picking the best knife. Strength is how well the blade can hold up without deformity under pressure and strain. How tough the blade is will be determined by its ability to resist cracking and chipping. Rust resistance is how well the blade will resist corrosion caused by the elements. Edge retention is also extremely important. Initial sharpness is important as well, but how often you’ll need to sharpen the blade should be a consideration. Finally, you’ll have to decide if you want a plain or serrated edge. Some blades are partially serrated. What type of edge you’ll want depends on what you’ll primarily be using the knife for. A completely straight or curved edge is best for pushing types of cuts such as skinning an animal. It would also be useful for scraping and work that involved detailed precision. A serrated knife would be best for slicing through wood, leather, or rope. A partially serrated knife is a combination of both and usually has the serrated section near the handle with the smooth part of the blade at the end of the knife. After the blade, the handle is probably the most important aspect of the pocket knife. There are different types of materials to consider. There are handles made of fiberglass, titanium, and zytel. Handles are sometimes made of bone or wood, but these are usually found on knives that collectors would have. Rubber offers a sturdy grip but obviously won’t last as long as other types of material. The handle should be constructed in such a way so that it doesn’t absorb moisture. The locking mechanism on a pocket knife must work flawlessly every time it’s used or the knife is useless at best, and even dangerous. Choosing a handle with glass breaking abilities at the end are also an option. Ergonomics, which is basically how comfortable a knife feels when you’re holding it, is an important aspect of the knife. In some ways, this is perhaps the most important part of choosing a knife. Even a high quality knife can be useless if it feels awkward and is difficult to manipulate. Little things like the type and style of the pocket clip can make a big difference as well. Some knife owners may want a clip that will allow the knife to stay low in the pocket. There’s less chance that it will fall out or draw attention to itself. A good locking mechanism is also important so the blade won’t clamp down on your hand while you’re using it. Pocket knives obviously can come in all different sizes and what size is best will depend on the individual and the primary reasons he or she is purchasing the knife. In general, blade sizes on average sized pocket knives will fall in the range of 2.5 inches to 3.8 inches. Larger blades for a pocket knife are unusual. Blades smaller than 2.5 can be found and are often used as simple utility knives. It should be noted that blade length laws vary from state to state. Since there are so many pocket knives and each have their own unique features it can be overwhelming when trying to choose the best one. It often comes down to individual preference and needs. The following, however, are three great knives with several versatile features. A relatively new knife to the market, the Patriot is a great folding blade that is the perfect size for carrying. The blade is 3.2 inches long and make of a high quality 7CR17 blade steel. It is the perfect size and strength for every daily task that I’ve thrown at it so far. It also has a frame lock design, making it incredibly simple, with very few moving parts. This means it is highly unlikely to ever fail during use. Other features include an ambidextrous thumb opening stud and a built in belt clip. The handle is made of steel and has a carbon fiber printed design that looks awesome. 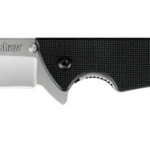 It is also the least expensive knife on the list at around $25. You can buy one on Amazon here. The tight construction on this knife makes it ideal for a variety of uses. This knife features the trademark hole in the blade near the handle and has an overall elegant curved shape. It also features the spider logo on the blade. According to many knife owners, the name “tenacious” perfectly describes this knife. It’s durable, versatile, and the thumb hole provides for exceptional ergonomics. The knife opens quickly and smoothly. It’s reasonably easy to close with one hand and the handle has a coating that makes extended use comfortable. The G-10 handle works well even in wet conditions. Considering that Spyderco Tenacious is lower in cost than many other knives, it surprises many owners by just how well it performs. Besides its trademark thumb hole, this knife has a reputation for being incredibly sharp. The clip is 4 way and solid steel. The knife is ideal for camping, hunting, and serious outdoor work. This knife can be purchased for less than $100 dollars. The blade is 3.39 inches in length and .118 in thickness. The overall length of the knife is 7.76 inches. The leaf shaped blade consists of 8Cr13Mov stainless steel. The hole diameter is half an inch. The knife weighs 4 ounces. 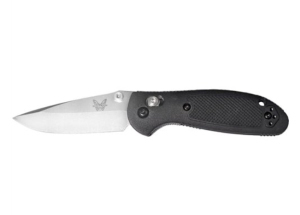 Benchmade produces both the Griptilian and the Mini Griptilian. 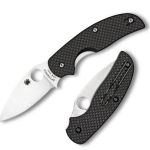 The Mini Griptilian has a drop point shape and comes with either a black coated blade or satin finish. When purchasing the Mini Griptilian, consumers have a variety of colors for the handle to choose from. A few include black, yellow, and pink. The pocket clip on the mini Griptilian is the same that is on the full size version. The handle is made of stainless steel liners, covered with fiberglass reinforced nylon. It’s relatively strong yet lightweight. Like the name implies, one of the outstanding features of this knife is the handle. There are plenty of different textures on the handle to make sure your grip is firm. Both the full size and the Mini Griptilian come with a thumb hole or thumb studs. The axis lock on the Mini Griptilian is easy to use and strong. This knife will cost between $100 and $120 dollars. The Mini Griptilian has a blade that is 2.91 inches long. The overall length of the knife is 6.78 inches, which is often considered an ideal size for a pocket knife. The steel is 154CM. The blade thickness is .100 inches and blade hardness is 58-60HRC. The Chris Reeve Sebenza came out in 1987 and gained a reputation for high quality and lasting durability ever since. The blade is made of S35VN steel that retains its edge forever. This knife comes in different sizes and is available for left or right handed users. This knife is considerably more expensive than the others on the list, averaging around $410 dollars for a plain, large Sebenza 21. The small Sebenza 21 can be purchased for approximately $350 dollars. Most owners will tell you that the superior quality and durability of the knife makes it well worth the money spent. 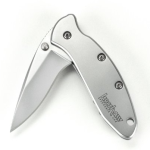 The titanium handle is constructed in a simple but almost elegant manner. The knife is slim, fits easily into a pocket, and features a double dip clip that securely locks the knife in place. This knife is considered simple and reliable. In short, the blade is considered one of the sharpest and toughest on the market. These knives are made in the United States. Many of the knives are made with unique graphics on the blade or the handle that will make the Sebenza 21 a complete original for the owner. Specifics on this knife, in particular the Sebenza 21, include the CPM S35VN stainless steel blade, a hardness of 58-59 RC, and a blade thickness of .125 inches. The blade comes in two different lengths. The smaller blade measures 2.94 inches while the longer one is approximately 3.6 inches. The handle is made of 6A14V titanium. The thumblug and pocket clip are both made of titanium as well. The Chris Reeve Sebenza, the Spyderco Tenacious, and the Mini Griptilian are all great every day carry knives. Which one is the best depends on how much you’re willing to spend, the quality you’re looking for, and ultimately, personal preference.